You have probably heard the expression “From Madrid to the sky” before. In today’s post we have a selection of the best terrace bars in the city, where you will be close to the sky while you enjoy a romantic evening with your partner or a fun night with your friends and a mojito in your hand. Probably one of the best terrace bars in Madrid. If you don’t believe us, ask any local. Why? Because from here you can enjoy one of the most stunning views of the city’s urban landscape. Tickets cost 4 euros and not only does that get you a stunning 360º panoramic view but also the chance to sample its delicious cuisine at the restaurant or a tasty evening cocktail to the sound of chill-out music. Even if they say so themselves, Cocina de San Antón is “a place where gastronomy, social life, leisure and culture come together in an urban and cosmopolitan environment”. The presentation itself is quite tasty, don’t you think? The rooftop is divided into four different atmospheres, adapting to the needs of each: the ‘chill-in’ area, where you can enjoy the best tapas; the indoor restaurant for lunch or dinner, the chill-out area, where you can have a few cocktails with friends; and the San Antón Greenhouse, the space where smokers can enjoy a delicious meal. The best option for art lovers. 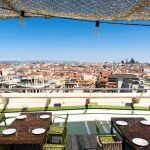 Visiting one of the best museums in Madrid and ending the day having something to eat on its rooftop is a fantastic experience everyone should try. The only problem is that it is only open during summer season, so hurry up! This multi-space building located in the heart of Malasaña has four floors with fashion, beauty and gourmet shops and even a cinema. One of its main attractions is its rooftop terrace, where you can sample some of the restaurant’s culinary specialities. On the third floor there is also a cocktail terrace to enjoy. From July 7 until August 26, this terrace will once again become the Magnetic Terrace, where you can enjoy a wide range of impressive cultural activities, ranging from electronic music concerts to a summer cinema programme with different genres. Which one do you like the most? If you have time, we recommend that you try them all!